Onam is considered to be the biggest festival of malayalies living around the world. This harvest festival of happiness, opulence and fulfillment is being observed by Keralites with more spectacle and vivacity. A blend of traditional and modern programmes are being arranged by various organizations and educational institutions add more fun to the festive season. 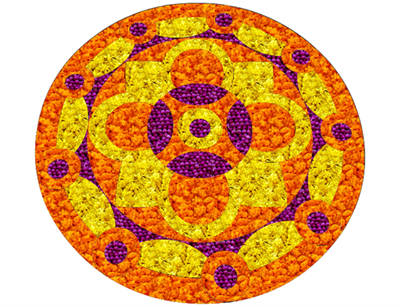 Designing Pookalams or Floral Carpets are considered to a major event during the Onam festival. Athapookkalam designing competitions are held in different parts of the state and outside the country wherever the malayali community lives. Organized by prominent organizations or clubs, youngsters enthusiastically participate in the Pookalam designing competitions. As like other professional contests or competitions, the Floral Carpets crafting too has various rules and regulations. Well before the contest begins, participating teams should have knowledge about the designs as well as the structured rules to get an upper hand in the competition. Here are the complete rules are regulations which have to be followed during the Pookalam designing competition. The pookkalam should have a circular geometric pattern while the measurement of the Pookalam should not exceed one metre in diameter. Participating teams must use only fresh flowers and leaves to make the Pookkalam. Materials like coffee powder, sawdust, coloured dried coconut or coloured powder should not be used during the process of designing. The pookkalam should be designed using petals of the flowers. (An exception is given, if the team wants to place a lotus in the centre of the pookkalam). Theme or concept based designs are allowed. The time allotted for designing the pookkalam is 1.5 hours. After the designing of Pookalam is completed, the teams can decorate it with traditional decorations like the Nilavillaku or Onathappan etc. After the completion of the Pookalam, the teams should clean the surroundings and make it ready for judging. Even though, these are the rules and regulations applied during the Pookalam designs, depending upon the regional interest, the rules can be changed. Participating teams should know time limit, number of participants, flowers to be used and other rules much prior to the competition.